Dawkins signed a reserve/future contract with the Titans on Monday. Analysis: Dawkins had a couple brief stints on the 53-man roster this season, but he did not see a carry during his two games with Tennessee. The 25-year-old went undrafted out of Colorado State last April and finished the season on the Titans' practice squad. Dawkins was waived by the Titans on Monday, Erik Bacharach of The Tennessean reports. Analysis: Dawkins did not play a single snap during his time with the Titans. The undrafted rookie out of Colorado State will search for a depth role elsewhere in the league if he goes unclaimed on waivers. 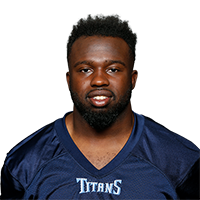 The Titans promoted Dawkins to the 53-man roster Tuesday, Jim Wyatt of the Titans' official site reports. Analysis: Dawkins was signed to Tennessee's practice squad on Oct. 11 after being waived by the team a few days prior. The rookie out of Colorado State will provide depth behind Dion Lewis and Derrick Henry. There are no videos available for Dalyn Dawkins. Click here to view all videos.